NOTE: The Eclipse Series of designer linear fluorescent fixtures are custom built to order. Extended lead times and minimum ordering quantities may apply. Please contact Customer Service for additional information. 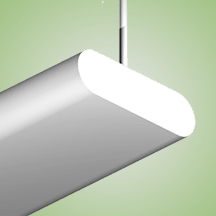 The ET Indirect Luminaire is a classically styled fixture fit for any interior. They are designed to be pendant mounted via a rigid or cord pendant making them adaptable for a number of ceiling types and applications. The fixture is a indirect light fixture. The fixture is ideal for indirect general illumination with no glare and an aesthetically pleasing housing. Provided with a ribbed acrylic diffuser. The housing is constructed of rigid extruded aluminum to provide a light weight load to ceilings. Fixtures can be individually mounted or installed in a continuous row. All reflective surfaces are finished with a high reflectance, lighting fixture white polyester powder. Special finishes available upon request. ETL listed. Suitable for damp locations. Damp location emergency pack must be specified separately. Ballasts are solid-state electronic. Ballasts and lamp holders are replaceable without removing from ceiling. Discrete voltage must be specified for emergency pack options when wired with flex.